Clearance Alert: Right Guard Body Wash + Coupon Deal! 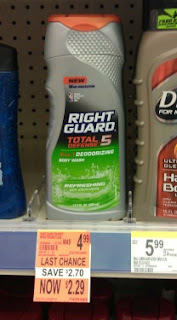 Check your Walgreens to see if they have Right Guard Total Defense 5 body wash on clearance. If so, bring this coupon to get a good deal on it!